Do you take care of your teeth? Did you know that water flossers can be more effective than dental floss in removing unwanted material from you mouth? It’s true, and that’s why so many dental professionals use water flossers on their own teeth. Not only are water flossers more effective than regular floss, they’re much more easy to use. You simply press a button or two and aim the jet where you need it to go. There’s just no need to wrap string around your fingers and become an oral contortionist when you can easily jet water between your teeth and get on with your day. 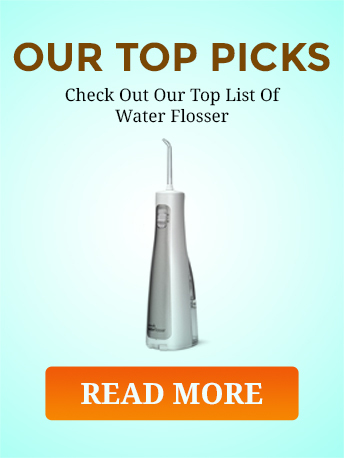 If a water flosser is a product you think you could use, you’re in luck, because I have done hours of research to discover the best professional water flossers available to buy today. This water flosser makes it easy for you to select the proper pressure for all types of cleaning. There are three different settings available, including Deep Cleaning, Normal Cleaning, and Low-speed Pulse for those with sensitive teeth and gums. With three different pressures, everyone can use this water flosser. You don’t need to worry about any cords or hoses with this water flosser, because it’s completely cordless. The compact design eliminates the need for an external water tank, and the internal battery is rechargeable as well. Just keep your water tank full and store on the charging stand, and you’re ready to get your teeth cleaner than they’ve ever been before. Not only do you get a professional grade water flosser, Panasonic decided to throw in a few extras for you as well. When you purchase the EW1211A, you also get two extra flosser nozzles so you’re all set for up to a year, and the AC charging stand is included to keep your flosser on so it’s always ready. This water flosser is a complete system that’s all ready to go. This water flosser from ToiletTree Products is loaded with features for such a low price. You can get it in bright white or midnight black. Most water flossers have tanks in the 4-5 ounce range, but the tank on this one is a whopping 6 ounces. That means you get more time to clean your teeth with each tankful. On average, users get over a minute of use when operating with the Normal setting, which should be just about the right amount of time to get your gums clean. You don’t need to plug this water flosser in, because it’s battery powered. High quality lithium ion batteries are used to power this product, so you should experience excellent performance and battery life. These batteries are rechargeable, so a USB charging cord is included with this flosser. ToiletTree knows that people hate loud devices in the morning, so they made an effort to quiet this product down. This version is 68% quieter than the previous one, so you won’t get a headache or wake up the whole house when you use it in the morning. And don’t worry, just because it’s quiet doesn’t mean it’s not powerful. This cordless water flosser is from Waterpik, the company that pioneered the water flosser industry. To keep things simple, Waterpik decided to use good old-fashioned batteries to power this water flosser. It requires 3 AA batteries, which are included and should last you for about four months with regular use. There are no USB or charging bases required for this flosser, it’s all contained in the compact unit. Lots of people prefer to brush and floss in the shower. Waterpik recognizes this, so they made the WF-03 completely waterproof. With this water flosser, you have the freedom to floss to your heart’s content in or out of the shower without fear of damaging the unit. Besides a world-class water flosser, you might be wondering what else you get in the box. In this case, Waterpik includes two standard flossing tips and an orthodontic tip which are all color-coded to avoid any mix-ups. Trust me, your spouse doesn’t want your flosser tip in their mouth. You also get a really handy travel bag to keep your unit and tips in when you go out of town. This is a nice touch that is extremely useful. For a high-performance yet simple water flosser, the WF-03 from Waterpik is a great option. To make sure your water flosser is always ready, ToiletTree decided to use high-quality rechargeable lithium ion batteries. When you’re not using the flosser, you simply place it on the included inductive charging cradle, and you’ll receive a full charge every time. You don’t have to worry about replacing any batteries with this water flosser. The Poseidon Oral Irrigator is designed to clean your teeth better than regular floss with less damage to your gums. This is especially true if you need to clean around caps, bridgework, or braces. To accomplish this goal, there are three different settings to use: Normal, Soft, and Pulse. Soft is for sensitive teeth and gums, while Pulse is intended to dislodge any tough food particles. You’ll always get your teeth and gums clean with this water flosser. When you buy this water flosser, ToiletTree Products is ready to guarantee you’ll be satisfied. They offer a 100% satisfaction guarantee for 30 days, and a one-year warranty against manufacturing defects to the original purchaser. This is clearly a quality product. If you do happen to have any issues, you can contact their customer service from Monday through Friday from 9am to 5 pm Eastern time. You will be satisfied with this purchase. This professional quality water flosser from Gurin features universal voltage capability, so you can use it anywhere in the world! This cordless water flosser features a high capacity water tank for longer usage between refills. For most users, they can floss both top and bottom without having to refill the tank. It holds 6 ounces of water, and it’s extremely easy to refill. For most people, you can just plan on filling your water flosser before or after each use. Power is provided here by rechargeable lithium ion batteries. When not in use, you just need to plug it in to the included AC adapter cord to keep your power levels maxed. This flosser will work with power from 100 to 240 volts and 50 or 60 hertz, so as long as you have the correct outlet adapters, you can use this flosser in any country on Earth. You never have to worry about this flosser letting you down. The Gurin Professional Water Flosser features three different operational modes for your convenience. They are Normal, Soft, and Pulse. Most people will be fine using the Normal setting, while those with sensitive teeth and gums will prefer the Soft setting. To dislodge a particularly stubborn chunk of debris, go with the high pressure Pulse. No matter what you’ve got wedged in your mouth, the Gurin Professional will get it out. If you’ve been looking around for a good buy on a professional water flosser, all five of the choices above are good ones. However, I always prefer to name an overall winner when I come to the end of my research. For the winner of Best Professional Water Flosser, I name the Panasonic EW1211A Dental Water Flosser the overall champion. While it may not have the largest water reservoir in the bunch, it’s one of the easiest to fill, and I like the rechargeable technology. When you throw in a quality charging station with extra tip storage and waterproof capability, the Panasonic stands out as the best value of the group.